New Year’s Eve is approaching, which means it’s time for the New York authorities to remind the public that the city’s various festivities remain attractive venues for terrorist attacks — while also assuring us that everything is going to be just fine. In a Thursday press conference, police commissioner James O’Neill said that while no specific threats had been made against New York, the NYPD was going to be extra vigilant in light of recent terrorist incidents in Nice and Berlin. Around 7,000 officers will participate in the New Year’s safety plan, which will include helicopter, water, street, and public-transit patrols, as well as a larger-than-usual law-enforcement presence at Central Park, Coney Island, and “houses of worship.” Meanwhile, the estimated 2 million masochists headed to Times Square for the ball drop will be subjected to metal and radiation detectors, as well as bag checks. In addition to the regularly scheduled street shutdowns, 57th and 59th Streets will be closed to traffic between Sixth and Eighth Avenues, apparently to keep motorists from getting too close to Trump Tower (the president-elect is expected to be at Mar-a-Lago this weekend). Also new: security assistance from the Sanitation Department. 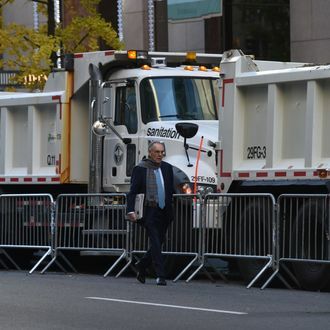 Given concerns about someone copying the methods of the Nice and Berlin terrorists, who killed and injured hundreds by driving into crowds of pedestrians, law enforcement has been experimenting with using Sanitation Department trucks as blockades, filling them with sand and parking them along the Macy’s Thanksgiving Day Parade route and outside of Trump Tower on Election Day. When full of sand, the vehicles weigh nearly 32 tons, making them “pretty immovable,” according to Sanitation Department spokesperson Vito Turso. This Saturday, Coney Island, Central Park, and Times Square will be protected by a combined 65 garbage trucks — a fitting tribute to a truly garbage year.